Postal Ballot Voting Results – 27/03/2019. Postal Ballot Notice to Stock Exchanges – 23/02/2019. Deccan Cements Limited (DCL), with a 2.3 million TPA plant, is a major producer of cement in South India, having been in the business of manufacturing and marketing of cement for over three decades. 'Deccan Cements' brand is very well entrenched in the market and occupies a leadership position amongst a multitude of competing brands. The brand is very strongly associated with the company's by now most familiar Corporate Mascot 'Dhamu'. 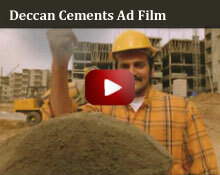 © 2013 Deccan Cements Limited. All Rights Reserved.